William Tyndale (1494 – 1536) was a scholar and theologian who made one of the first printed translations of the Bible in English. Executed for heresy, his English translations would later be published and form a significant part of modern Bible translations. 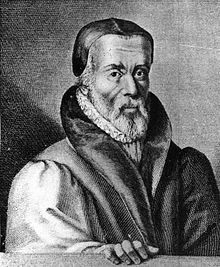 William Tyndale was born in 1494 in Gloucestershire, England. In 1506 he began studying at Magdalen Hall (later Hertford College), Oxford University. After gaining a B.A. and M.A., Tyndale was able to study the subject which most interested him – Theology. But, he was highly critical of the idea that one had to study for a long time before actually being allowed to study the Bible. During his time at Oxford, he sought to create Bible study groups with like-minded friends. William Tyndale was a gifted linguist and scholar, and known as a man of virtue and good character. However, influenced by ideas of the Reformation, he increasingly became known as a man of unorthodox and radical religious views. In particular, Tyndale was keen to translate the New Testament into English. He believed this would help ordinary people understand scripture directly and not through the filter of the church. In this, Tyndale was influenced by the reformation ideas of Martin Luther. Tyndale would claim that the Bible did not support the church’s view that they were the body of Christ on earth. After studying at Oxford, he also went to Cambridge where he added to his growing range of languages and became a leading professor of Greek. After leaving Cambridge in 1521, he became a chaplain in Little Sodbury, but he was soon criticised by fellow churchmen for his radical viewpoints. In 1523, he left for London hoping to translate the Bible into English. However, he struggled to receive any support or backing, and so he left for the continent. During his time on the continent, he visited Martin Luther and wrote extensively on scriptures and continued his translations of the Bible. In 1525, a first English translation was published in Worms. By 1526, copies had been smuggled into England where they were soon denounced as heretical and even burnt in public. Cardinal Wolsey denounced Tyndale as a heretic in 1529. In 1530, he wrote a treatise critical of Henry VIII’s divorce. When the English King found out, he was furious and sought his extradition. Tyndale is best remembered for his hope that the Bible would be translated into English to allow the common people to be able to read the Holy Scriptures. 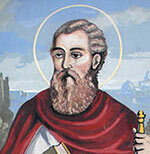 His translations also proved to be quite popular, becoming the basis of key future Bible translations. It is estimated that around 80% of the King James Bible is Tyndale’s work. Four years after his death, King Henry VIII asked for English translations of the Bible to be published. These were heavily based on Tyndale’s original translations. Tyndale introduced new phrases and words into the English translations. When criticised for his translations, Tyndale replied that he sought to translate the essence and spirit of the original Greek versions and avoid the tendency to follow the dogma of the church. Citation: Pettinger, Tejvan. 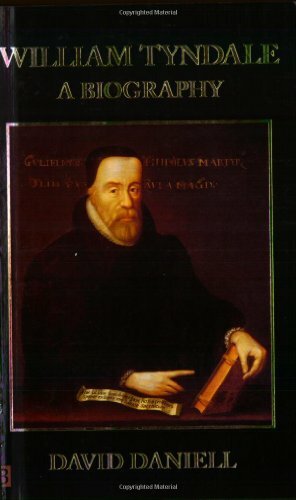 “Biography of William Tyndale”, Oxford, UK – www.biographyonline.net. Published 5 August 2014. Last updated 7 February 2018. Protestant Reformation – The Protestant Reformation saw a new form of Christianity based on scripture rather than the power of the Pope. Includes Martin Luther, William Tyndale, Erasmus and King Henry VIII.